I have watched a number of Super 14 games over the opening two weeks of the season and I now think a name change is due. To put it bluntly, there is no way the Super 14 is Super, it's average at best. Occasionally it's above average but more times than not its below average, terrible, awful, and in no way is it Super. The referees have a lot to answer for, and the bloke who thought up the 'new' ELV's should be hung drawn and quartered because after many months of trials, matches and the like, not one rugby expert can tell me what the bloody hell they are and what they have achieved. Even the name is confusing - ELV's, Experimental Law Variations - here's a tip, call them something we all understand. New Rules! Can anyone tell me of another game whereby every penalty has to be explained to the viewing audience by way of a television graphic (e.g. did not release ball)? And while I'm on that, can anyone tell me why a team on the attack, 10 metres out from scoring a try with the opposition under enormous pressure would not release the ball? Believe me I'm not the only one. I use the examples of some former All Blacks and Wallabies who now make a substantial living (good on them) as expert television commentators. Murray Mexted - 85 matches for the All Blacks - "I have no idea what that penalty was for." Rod Kafer - 12 Tests for the Wallabies - "Why was that a long arm penalty? It should have only been a short arm penalty." Phil Kearns - 67 Tests for the Wallabies - "Surely that could not be a penalty?" Matthew Burke - 81 Tests for the Wallabies and current Waratahs kicking coach - "Don't even get me started, I've got no idea, too confusing for me." The Bride (no Tests for anyone but she's still a fair judge) - "This referee must know its a TV game because he is blowing the pea out of the whistle." And they were all from last weekend. Last Friday night Stuart Dickinson didn't single handedly ruin the game between the Waratahs and Chiefs but by geez he did his level best. I know the players didn't help but if this is what the next few months of Super 14's is going to toss our way, then the game played in heaven will need divine intervention to bring it back from the dead. On Saturday night, the referee in the Brumbies v Crusaders match (I won't mention his name because I can't be bothered looking it up) penalised the Crusaders for moving half a metre off the spot as the team were readying themselves for a scrum. Half a metre! 500 millimetres. 20 inches. Are we serious? The field is 100 metres long and this guy is worried about half a metre. Who cares? I'm sorry if all the diehard rugby fans are disagreeing with what I'm saying here but feel free to send me an email and tell me what I'm missing. Rugby used to be the running game, now it just gives me the runs. "Getting a point for finishing close to the team that beat you is like getting a ribbon for coming 6th in the school 100 metre race." Every week I and many thousands of others pile into pubs and clubs in Australia and New Zealand hoping for a miracle so we can understand what's going on. I'll tell you how bad it is. A Wallaby prop forward told me, that he watches the replays while he's playing so he can see what the penalty is for and even he shakes his head. Now if the guys playing the game don't know, and the people watching don't know, then we are in a whole world of hurt. The South African games were the best, with the locals showing plenty of attacking flair. The Bulls racked up nearly 50, The Sharks had a strong win. It's a shame here in Australia those games are on at 2 in the morning, but hang on, aren't the South Africans thinking of pulling the pin on the Super 14? And don't even get me started on the bonus points. Getting a point for finishing close to the team that beat you is like getting a ribbon for coming 6th in the school 100 metre race. If you get beat you get beat. Four points for win, nothing for a loss. Ponder this example and you'll get my drift. 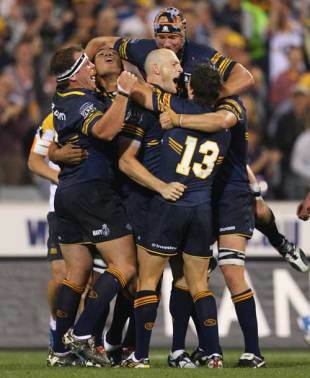 Over the weekend the Blues got thrashed by 59 to 26 and the Crusaders got beaten by a kick after the final siren. They both got a bonus point. I can hear the leather patch brigade now screaming at their lap tops from all places but I'm sorry for telling the truth. The Six Nations is actually good to watch (except for England), so its not the game of rugby that's the problem, it's the over refereeing here in the Super 14. It may sound a bit harsh but the bottom line is the Super 14 thus far has been awful. I understand its only round two, its early days, but right now I'm starting to think that the cricket might not have been as bad as we thought.